Cathay Pacific First Class is something I'll never say no to, so when I needed to make a cross-country trip both for work and to visit some relatives, and there was a British Airways transfer bonus from AMEX, I opted to top off my Avios account to book a couple of first class awards for the munchkin and me. There was no wait as we were whisked through priority boarding, and we were greeted and escorted to our seats, 1D and 1K. We were introduced to the flight attendant who would be taking care of us, and he graciously took our coats and hung them up. I believe the crew on this flight alternate between Hong Kong and Vancouver based crews, and our crew was Hong Kong based, although they would be ending their shift in Vancouver and a new crew would be taking over for the ongoing Vancouver to Hong Kong flight. 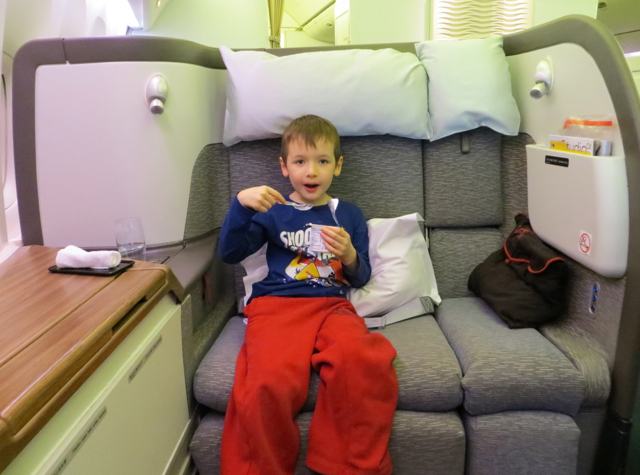 I settled the munchkin in his seat, and he finally got a chance to finish his yogurt from the British Airways Galleries Lounge, since he'd wanted to eat something just as boarding was being called. 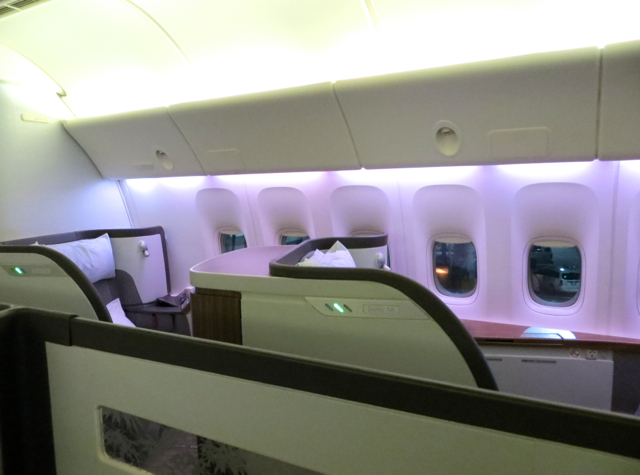 I've said it before, but I just love how spacious and wide the Cathay Pacific First Class seats are–enough for two to sit side by side. We were both brought hot towels and offered a welcome drink, for which we chose water. 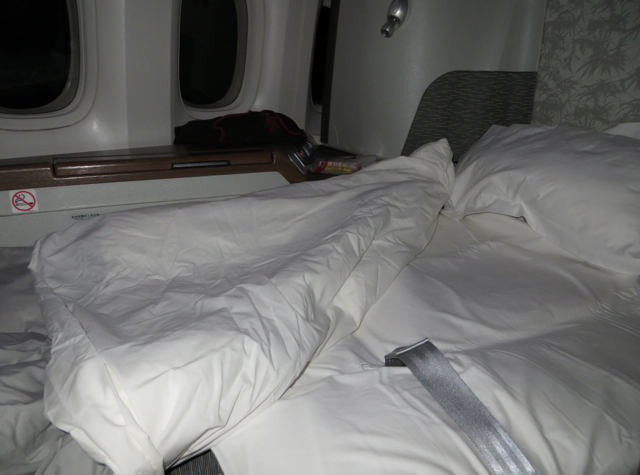 Also prior to takeoff, we were given Shanghai Tang pajamas and amenity kits. The men's amenity kit still includes Acca Kappa amenities, in an Ermenegildo Zegna case (see our prior Cathay Pacific First Class review) but the women's case by Trussardi is now a brown one, instead of the previous white Trussardi case. I don't care for the current brown case at all, given the flapped instead of zippered design and cheaper look and feel. The Aesops amenities inside, however, remain the same. And here's my seat, 1D. For once I didn't mind having a middle seat! It was convenient to be able to lean forward and see the munchkin if he was also leaning forward. 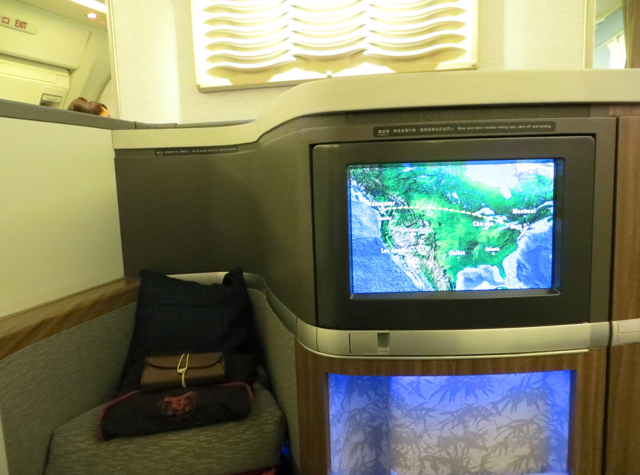 And here's a view of the in flight entertainment screen and the ottoman. I pretty much never use the IFE, but by the accounts of those who do, Cathay Pacific offers one of the better systems, with extensive programming choices. It took a little while for takeoff (~25 min.) but once we were finally airborne, I asked the flight attendant if my son's seat could be turned down into a bed, and this was quickly done. While a small size of Shanghai pajamas were provided, they were of course still too big so we didn't use them. 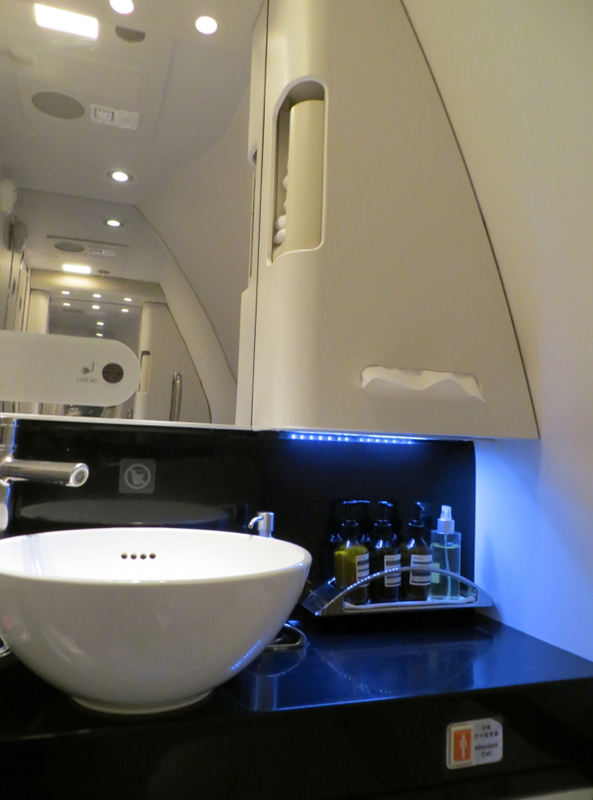 I did use an eye mask, which came in very handy due since the cabin wasn't made completely dark until a bit later. Next, I'd opted for Stir-fried Lobster, but this was actually preceded by two Chinese starters: Double Boil Conche with Dried Scallop Soup, and a cold plate of Vegetarian Duck. To be honest, I've never been that impressed with most Chinese soup broths, and the Cathay Pacific version was no exception. Perhaps if I'd grown up with them I'd like them better. 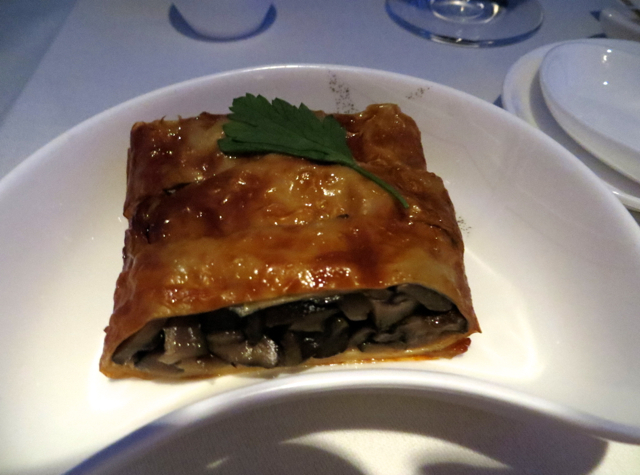 I was far more impressed with the Vegetarian Duck, which I would never have ordered on my own, but which was wonderfully savory from the meaty mushrooms used, and perfect when anointed with some of the supplied roasted red chili paste. 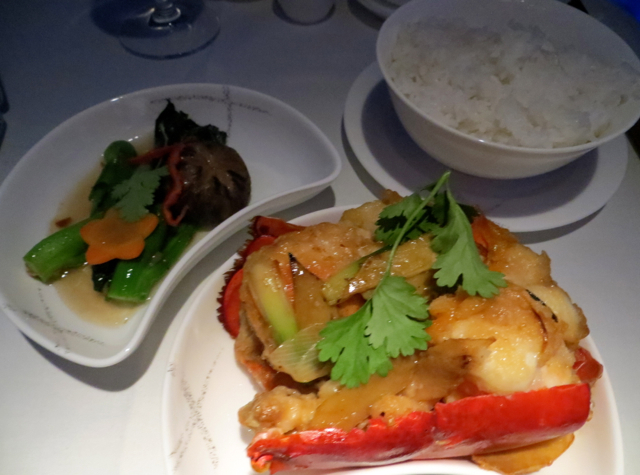 The Stir-Fried Lobster was artfully presented, in its shell, and had great flavor, even though the texture clearly suffered from reheating. I also didn't care much for the scallion it was stir-fried with, which was overpowering compared to the delicate sweetness of the lobster. The kailan (akin to broccoli rabe) was perfectly cooked, crisp tender. On past flights I haven't been too taken with Cathay Pacific desserts, but since I've had the cheese plate before I decided to try the Raspberry Yoghurt Cake with Raspberry Coulis. 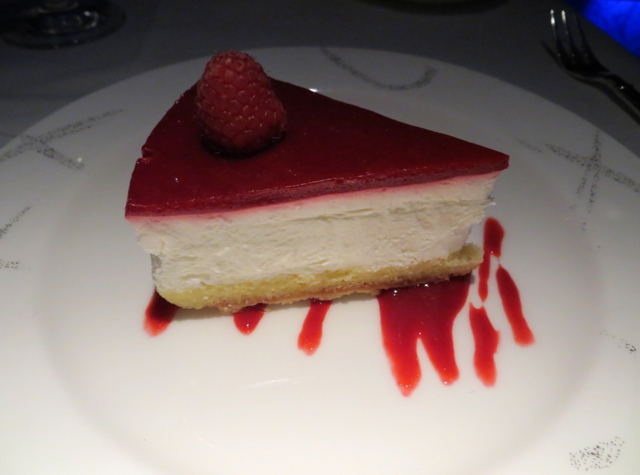 While it won't win any prizes in any French pastry competitions, it was the best dessert I've had to date on Cathay, with a clearly discernible yogurt tanginess complemented well by the raspberry sauce. 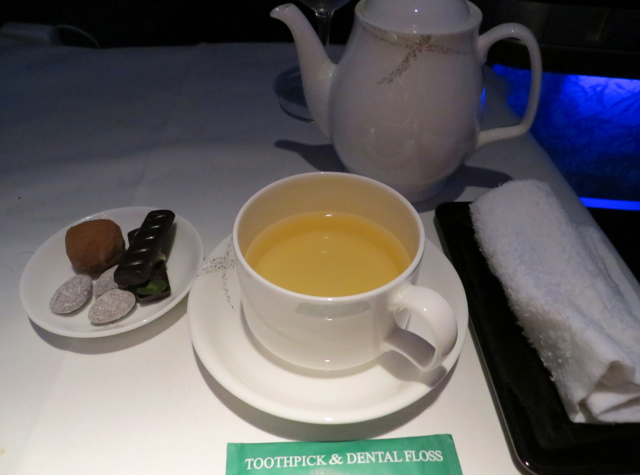 I finished off with chamomile tea, and saved the accompanying pralines for my son, since he slept through the entire flight. After finishing, I went to the bathroom to change into pajamas. It was a normal, small bathroom although kept immaculately clean (the toilet paper was always folded into a “v” and there was never a speck of water anywhere on the counter or floor). There were additional Aesops and Temple Spa bath amenities as well. I had asked for turndown service, but my seat hadn't been converted when I came back, so I asked and it was quickly done. I'm guessing it was just a misunderstanding or I wasn't clear enough, because every other aspect of service on this flight was so attentive and thoughtful. Even though it was a short flight, I was definitely grateful to be able to sleep for 3 hours–it makes a difference, when arriving at almost 2am Vancouver time, 5am NYC time. 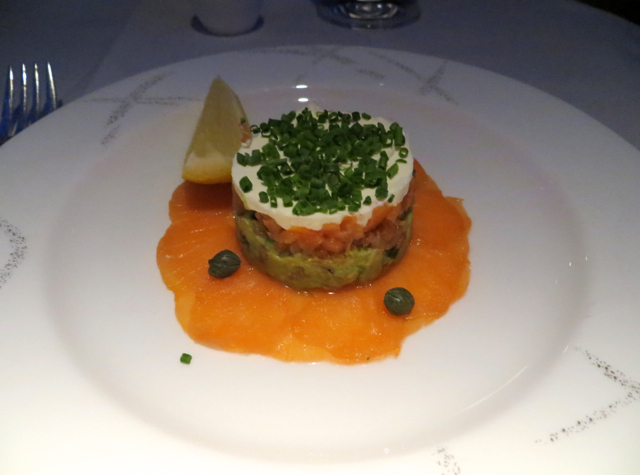 The Verdict: At just 37,500 Avios each way in first class, this is one of the best uses of Avios: a bit over 5 hours of a completely first class product that blows pretty much any other way of crossing the country out of the water. Yes, I realize it's not super convenient if your destination is San Francisco or LA, but if you can work in a short stay in Vancouver, I highly recommend that as well. More on that in future posts! 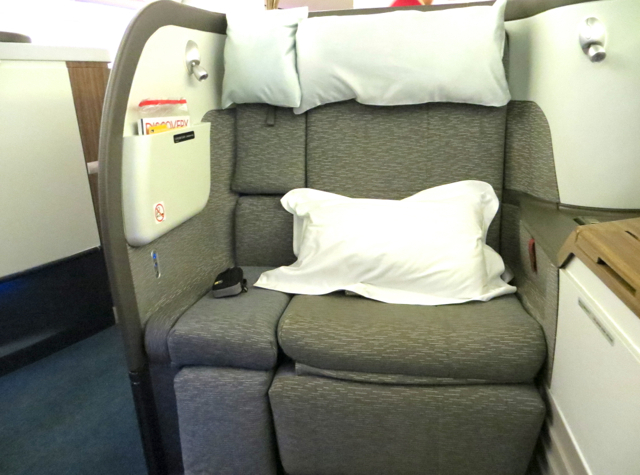 If you've flown Cathay Pacific first class NYC to Vancouver or Vancouver to NYC, what was your flight experience?